seriously. 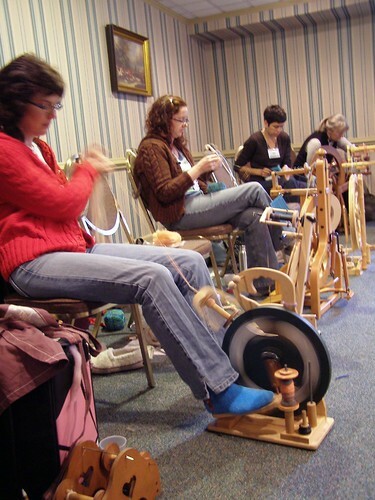 i know more than double what i knew about spinning before i went away to SOAR… if you’d like to see me saying so, in an oh-so silly manner, check out stefanie berganini’s video blog. isn’t she cute? and so very sweet. all the Spin-Off staff were fabulous and worked so hard to make SOAR fabulous. thanks ladies!! anyhow, as meghan would say, heads were exploding. just a note about meghan, she was my fellow SOAR scholarship winner and my roommate for the week. she also runs the stitch it! podcast which you can find if you click on her name above. our heads started exploding right off in Rudy Amann’s Spinning 201 3 day workshop. we got to try many kinds of wool and spin them using different techniques. Rudy, a former high school math teacher and assistant principal, has incredible grasp of the precision art of spinning. just what i was lacking and just what i needed. here you see amy, the aforementioned meghan, and dana. sorry, i’ve no idea how to right it, but here’s a short camera video i took of the wheels in motion. 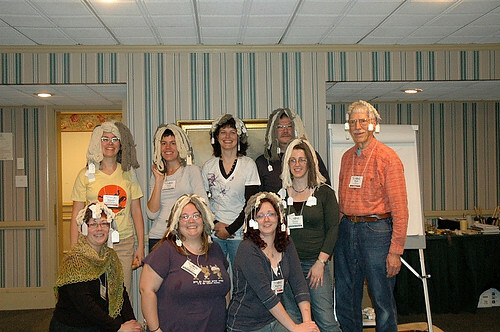 and here are a bunch of us at the end of the three days with our sample skeins on our heads. what a fabulous class and i met so many great people! i’m sure that much of what i learned will spill out onto these pages over the next few months in between the craft fair knitting/spinning. if i didn’t give you enough in this first entry, i suggest going to dana, amy and diane’s blogs to see/read more. dana and diane blogged from soar even. and be sure to listen to meghan’s SOAR podcasts when they come out! they should be good. as to those tomatoes that i thought ben might have to pick while i was away? no chance. the forecast is 80 degrees here today!! he had more ripe tomatoes than he knew what to do with. and now, i’m going to go pick some more. have a great day! This entry was posted in community, spinning by cosymakes. Bookmark the permalink. Welcome back! I’m so glad you had fun. I’m a little jealous: wish I could have been there! Welcome home. Gotta say I’m a bit jealous too! I want a lesson next time we get together! !